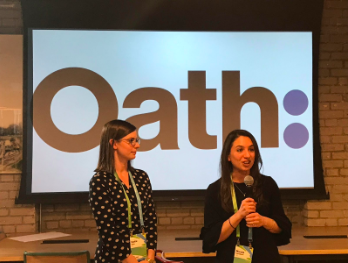 Oath's first RightsCon is in the books. It was a whirlwind week surrounded by the world's foremost experts on matters of digital rights to discuss some of the most pressing issues facing our industry from content moderation to digital privacy to internet shutdowns to transparency and diversity. In addition to introducing Oath to the RightsCon community, we also did something special: we marked the occasion of our Business & Human Rights Program (BHRP) hitting double digits (10 years!) with 2500 of our closest digital rights friends. I had the privilege of moderating a discussion with Kevin Bankston, Director of New America's Open Technology Institute, Rebecca MacKinnon, Director of the Ranking Digital Rights Project, Michael Samway adjunct professor at Georgetown University, Cynthia Wong, Senior Researcher, Internet & Human Rights, Human Rights Watch and Katie McInnis, Policy Council, Consumers Union on progress made in the effort to advance digital rights over the last decade. We reflected on the advent of the BHRP and the founding of the Global Network Initiative which also turns ten this year, the role that partnership and collaboration have played in these efforts, as well as the drivers that bring about progress and change. A common theme that ran throughout our discussion was that a single company that moves first can have an impact on the wider industry. Our BHRP was the first program of its kind dedicated to digital rights issues in the tech industry and we hope we've set the bar high for building the infrastructure of responsible decision-making inside companies. Katie, our senior legal counsel in the BHRP, joined conversations on collaborative approaches to human rights challenges and the benefits of multi-stakeholder partnerships in moving the needle on complex policy issues like internet shutdowns, and Oath's General Counsel for Canada, Seema Reddy, addressed trends in transparency reporting in Canada highlighting Oath's first transparency report. Thanks for the chance to share and learn with the best and brightest on the most pressing issues at the intersection of human rights and digital technology. See you at RightsCon 2019 in Tunis!